BRUSSELS — Melania Trump joined the spouses of other NATO leaders visiting a children's hospital and touring a Brussels museum on Thursday. Mrs. Trump worked through moments of awkwardness and language barriers to help ailing children make flowers out of crepe paper. "So beautiful," she told them. They shared opinions on books, movies and favorite flowers — she said hers include orchids and peonies. Children have been a theme of Mrs. Trump's trip, her first to Europe as the president's wife. She visited a pediatric hospital in the Vatican and participated in a forum with Belgium's Queen Mathilde on protecting children from online exploitation. The outing of NATO spouses, which took place away from a summit of member nations, included a museum dedicated to Belgian surrealist painter Rene Magritte, best known for his "This Is Not a Pipe" painting — of a pipe. Magritte made a career of juxtaposing contradictory images — showers of bourgeois clerks in bowlers raining down on drab Belgian streets, or huge apples suffocating in claustrophobic living rooms. 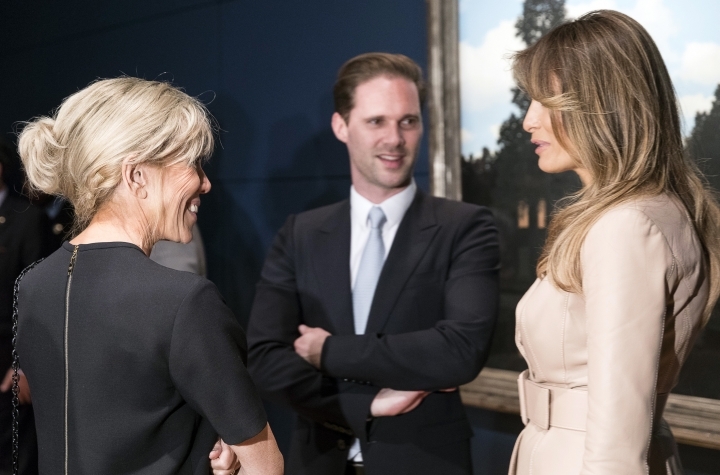 Viewing the paintings, Mrs. Trump chatted with Brigitte Macron, whose husband won the French presidency this month. Both women share a large age gap with their husbands — Mrs. Trump is 24 years younger than President Donald Trump, while Brigitte Macron is 24 years older than French President Emmanuel Macron. At a royal palace visit, Mrs. Trump exchanged views with Turkish President Recep Tayyip Erdogan's wife, Emine, Mrs. Trump's off-the-shoulder black dress contrasting with her Turkish counterpart's pale blue headscarf. Mrs. Trump's modeling experience came in handy in her Belgium stops, as she struck carefully angled poses and peeked over her shoulder at photographers.